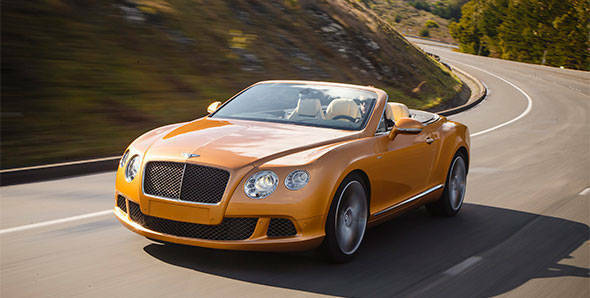 Bentley revealed their fastest road car, the GT Speed Coupe a few months ago. And now it is time to stow the roof in the boot, let the sun come in and enjoy the good weather. Just in time for summer comes the new GT Speed Convertible, the fastest convertible car in the world with a top speed of 325kmph. Under the skin this is the same car, more or less, as the GT Speed Coupe. That means that same storming 625PS twin-turbo 6-litre W12, the same block-shifting 8-speed automatic. The same insane thrust when you floor it. And that same sense of galactic poise and calm when you just ask of the automobile to smoothly swallow whole continents at an even gallop. With a little bit of wind ruffling your coiffure. Bentley did have to re-bolster the structure to take care of the roof's lost structural contribution and that makes the car just a smidge less rigid and just a touch heavier. But if you do notice either of these two aspects of the car, you're either an F1 driver or one of those anoraks who sits hours in darkened rooms chatting on auto forums while memorising all the specs. My point is, the kind of pace you need to keep do feel the structural difference isn't possible in daily driving. Epic, just as you would expect it. I also drove the GT Speed Coupe at its launch a few months ago, so I wasn't surprised by the rhomboid stitch pattern or the new available carbon fibre trim and all. But I was pleasantly surprised by how comfortable the cabin is and how Bentley manage to blend the sporty, old-world charm, new-world luxury and top notch materials in their cars. On the move the engine is a silent partner when you're a-lope but will happily churn out a far angrier tone when you decide to see what the traction control systems are like. The transmission is smooth and very, very quick and it will never let you feel like you'd be better off with a twin-clutch automatic, which is quite the achievement. Underneath the skin, the suspension is one of my favourite bits. Despite the great roads on the launch route, the odd pothole, frost-heave or cracked tarmac was absorbed with a sporty contempt, allowing you to feel the nature of the tarmac without really allowing the severity of shock from coming in to the cabin. But the active suspension also firms up, noticeable when you start upping the pace, allowing the smooth ride to transform in a sporty, agile platform through the twisties. Like with the Coupe, cornering hard isn't without the sensation of immense weight - this is a large car, after all - but the weight is just a sensation rather than a hindrance. Coupe or Convertible for India? But the sad reality is that a fabric roof can be a pain to maintain in dusty, dirty conditions like ours. And eventually some pigeon or other irritant of the avian persuasion will commit the sin of dropping their dropping on the roof and your minions will have a hard time cleaning it off. These are the only reasons why I would suggest you should get the Coupe over the Convertible. Me? I've always had a 911 Turbo Convertible in my garage, so the GT Speed Convertible would be my personal pick of the two. In theory, yes. The GT Speed Convertible is priced at Rs 3.21 crore ex-showroom (subject to exchange rate fluctuations). Of course, there are two provisos. First, this price is for the base car. Which may already have everything short of a solid gold kitchen sink (not literally, of course) but there is an options list which will tempt you. And if you give in, the price changes. Second, hardly any Bentleys are sold without options and modifications which means you can buy one now, but actual delivery might take a short while.